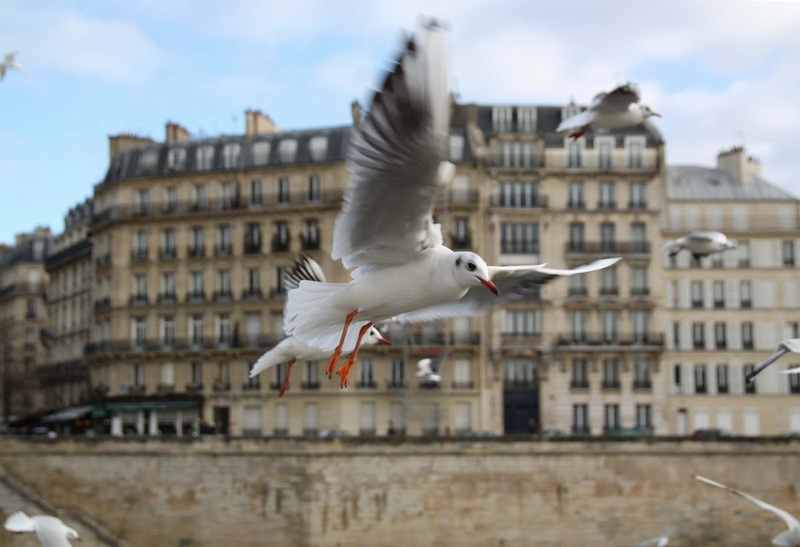 When doves cry (for real, as opposed to in the Prince song) in France, they cry "rou-rou" and, with the rolling French R, it sounds much more realistic than an English "coo-coo." A quack-quack here and a quack-quack there only happens in English-speaking countries. In France, the ducks say "coin-coin" whether they are here or there, and it sounds something like "kwen-kwen" and, come to think of it, a lot like a duck quacking. Cats say "miao" when they are meowing, and it's pronounced just like "meow." And they say "ron-ron" when they're purring. Dogs says "ouah-ouah" which sounds like what babies say in English. "Wa-wa!" Roosters wake you up with "cocorico!" "Bêêê-bêêê" black sheep, or any color sheep or goat for that matter. Donkeys say "hi-han" which is pronounced much like "hee-haw" with a French accent. Therefore, no H.
If you say "tagada" to a French child, they will immediately know it is the sound of a horse galloping. But if you ask them what horses say, they will look at you blankly. Sometimes, in cartoons, they might say "hihihihi" or "hiiiii" but mostly French horses appear to remain silently stoic as they gallop around going "tagada-tagada". Pigs snort "groin-groin" which is hard to transliterate into English. Something like "grwen-grwen" and you have to roll your R in the back of your throat. Possibly the hardest animal noise for an Anglophone? They might also say "naf-naf" or "hui-hui" which are both much easier on the Anglophone tongue. Birds who would cheap or tweet instead say "cui-cui", though if you are tweeting on Twitter, then you would "tweet" even in French. Crows say "croa- croa" instead of "caw-caw". 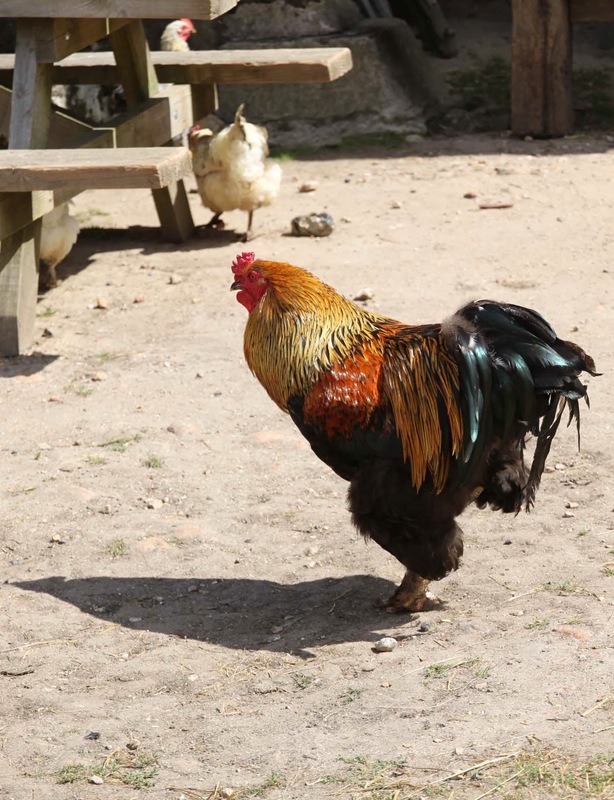 Chickens say "cot cot cot codet" or "cot-cot" when they are feeling lazy. Or when you are. What does the fox say? Nothing in French, either. And though it's not an animal noise, you should know that "yum-yum" in French is "myam-myam." I say this often, when eating those who used to coin-coin, groin-groin, cot-cot, or glou-glou, or (need I even say it?) when eating cheese from those who meuh-meuh or bêêê-bêêê. Meule d'Alsace is a cheese that certainly looks like it would travel well. My goodness, it looks like you could actually use it as a spare tire, in fact. But a meule is a grindstone. Which is bigger than a regular tire. And lest you think that's an exaggeration, just check out how big it is -- bigger than my daughter's head in a bulky winter jacket. So you'd think given how sturdy it is, that it would be a cheese you could find anywhere. But the only place I've ever seen it is actually in Alsace. I wondered for a while if it simply goes by another name elsewhere, but since they call it a Meule d'Alsace, and they're the ones making it, I'm going to believe them. It's big in size, and also in flavor -- a real mountain, cow's milk cheese that's pressed and aged. Though it's a hard cheese (can you imagine a soft, oozy cheese this size? How would you move it?! ), it still remains moist, with its notes of grass. Its stink is not as huge as its size. You should be much more afraid of the smaller cheese also native to the Alsace area -- Munster. In fact, a meule is basically just a really, really big tomme. It's a tomme that weighs a ton. Most cheesemakers and sellers will offer Tomme d'Alsace, but since I buy this directly from the farmer, and he calls it a Meule d'Alsace, I'll take his word for it. Not only is Meule d'Alsace made from cow's milk, but the word "meule" even starts with the sound a cow makes: "meuh!"